POF received more than 6 billion page views per month, 149 million visitors per month, 1.6 million uniques daily and has a 15% turn over of new visits per month. The average user is engaged for 15.1 minutes and browses through 22.5 page views per log-in. 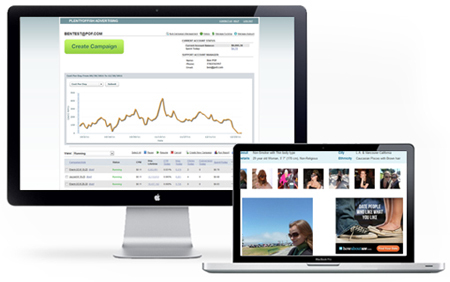 Manage Your Ads: Setting up your account is quick and easy! Create new campaigns, modify existing ones, and organize your advertising initiatives in the way that works best for you. Track Your Results: Our advanced reporting options allow you to see exactly how you are delivering and converting, along with where you are spending your money, and what you are spending it on. POF�s real strength arises from its targeting capabilities. Very few websites can offer in depth, accurate demographic targeting at the same magnitude as POF. Only $25 to get started! Click here to start running your first campaign! !